Four days of dryness abruptly ended as torrential rains drenched the northeast. Cape May was not spared. Fortunately I was off the saddle this morning, and relaxed around the house unconcerned that Countri Bike was getting soggy in the garden. The bikes are designed to withstand rain, snow and sun. By noon it was dry, so Mark, Carol and I biked to Cape May Lighthouse to officially finish off my Tour de Shore. Mark even took a spin on the Citi Bike and loved its design and durability. En route back, I met their friends Ed and Kathy who were curious about Countri Bike. Ed is a music teacher and Kathy an attorney. 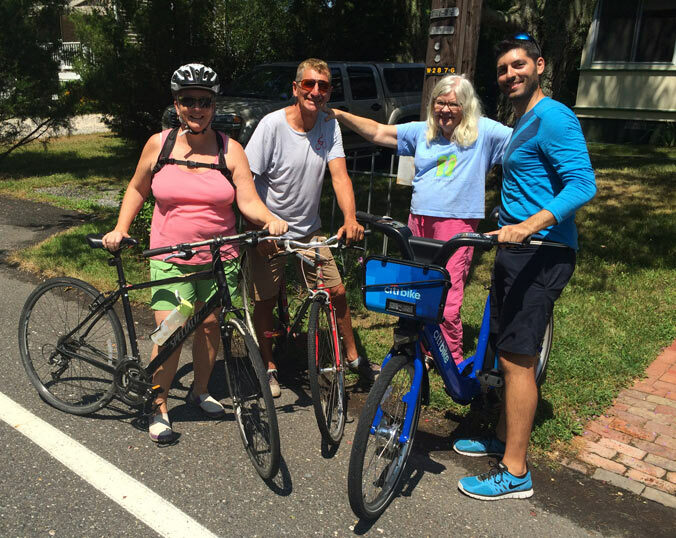 They mused about bringing bike share to Cape May. Before I could start a bike sharing revolution in South Jersey, I had to leave to catch the 4:30pm ferry to Lewes, Delaware. Mark and Carol rode with me to the terminal. Unlike Seastreak between Manhattan and New Jersey, this ferry does not charge a fee for bicycles and was only $10 per passenger. Love that. After one last round of hugs with my wonderful Cape May hosts, I boarded as automobiles lined up behind me. I secured Countri Bike to a bike rack and lugged Travoy upstairs to the main deck. I popped open a laptop, enabled my wi-fi hot spot and worked al fresco to the gentle rocking of the boat on a breezy 90-minute ride across state lines. George Washington didn’t have it this good (he also didn’t cross here, but whatever). River dolphins surfaced on the port and starboard sides. 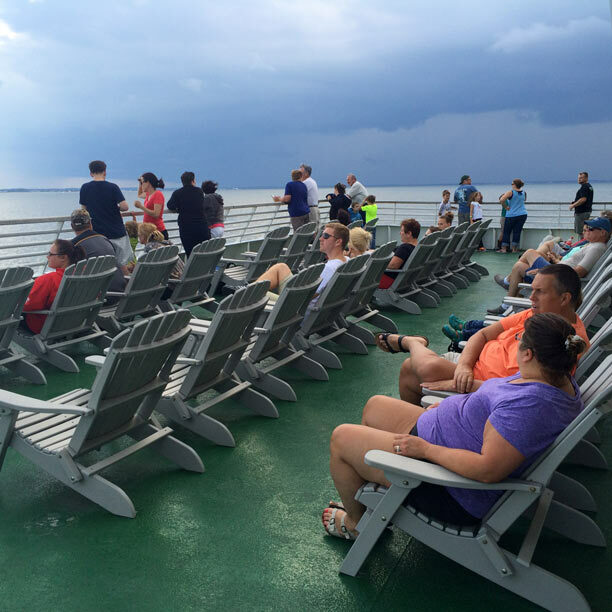 Trouble, however, lurked ahead as storm clouds gathered in anger on the Delaware horizon. An announcement urged passengers to return to their vehicles and brace for a cold front with severe storms. The boat docked and crew dressed in yellow rain gear orchestrated the exit of automobiles. Bikes were first on but last off. A crew member approached to wish me the best. He hoped I didn’t have far to ride because it was about to get ugly outside. I went into emergency RAM (RAin Mitigation) Mode, which consisted of breaking out a Sea to Summit waterproof sac to protect my laptop and other electronics in the front basket. A separate waterproof plastic bag encased my phone, which hung on a lanyard around my neck for easy grabbing to consult Google Maps. Travoy had its own rain cover, albeit ripped after taking a tumble in Sea Bright, NJ. Shortly after I snapped the obligatory Welcome to Delaware pic, drizzle gave way to downpour. I only had about five miles to ride to Michele’s condo, but the storm turned the safety of the shoulder into a giant puddle or river depending on the grade. Soaking wet, I plodded along in no particular panic. Once you’re wet, you’re wet. Live with it. I even thought of taking off my shoes and riding barefoot. Crossing Delaware Route 1 from Savannah Road created an anxious moment (photo above, right). I was supposed to stay on Savannah but accidentally turned on Route 1, a divided highway that runs north to the capital Dover. I crossed the northbound traffic lanes and then got stranded in the grassy median, a little valley where I waited ankle deep in water for a break in southbound traffic. I felt on the edge of life, vulnerable to rain and traffic, yet defiant to press ahead like Washington himself. Dry towels and a hearty vegan meal awaited at Michele’s condo. My host retired from the military after 30 years where some of her work included event coordination. Everywhere I go I meet event planners. Michele is now invested in real estate while working on her dissertation, Where One Lives Matters, about how policy affects our health. Michele is vegan and has been vegetarian since 12 years old. She said 40% of kids in Delaware are obese and that public health is important to her and the governor, who also bicycles. She was seeing him tomorrow at a ribbon cutting ceremony on a new trail near the beach. She and her friend Jay, who was over for dinner, are avid cyclists planning a trip to NYC later this month. It will be Jay’s first trip to the Big Apple. They will bring their bikes on Amtrak and cycle around the perimeter of Manhattan. To give them a head start, I brought two NYC bike maps, which unfortunately had gotten soggy on the ride over. As for bike security in the big city, I recommended the usual u-lock and cable. Michele asked about outdoor eating options so they could keep an eye on their bikes. “Yeah, there is sidewalk seating, but bike theft is always a concern. Unless your bike is $6,000, then I wouldn’t worry about leaving it locked up outside for an hour,” I said. My eyeballs fell into my mouth and rolled out my crooked jaw. After hip replacement surgery, Michele needed to find a customized solution. While many people think $11,000 is an absurd price for a bicycle, Michele’s reasoning sounded good to me. By rejecting consumerism and focusing on things that are really important to her, namely being fit and healthy, biking helps Michele accomplish her happiness through body and mind wellness. With that, we dug into dessert—succulent cantaloupe fresh from the garden. Next up: meet Jay, an inspiring 75-year-old who has logged 100,000 miles on a bike in the past 20 years.